I'm posting my new articles over on Medium. Please check them out over there. I'm coming back to blogging after a few years buried under project work, and I want to explore some lessons learned as a technology leader managing a department growing rapidly and going through significant changes. My department builds educational software products and has grown from a couple employees and a dozen consultants to over 70 employees and 100 contractors/consultants over 3 years. The saying goes, "What got you here, won't get you there". This is especially true for leaders in technical fields like software engineering. It means you probably have the hard skills (coding, automation, design, coordination, etc.) and logical problem solving that helped you be successful as an individual contributor. Now you are in leadership and probably finding those skills are not helping you solve the same problems. Here are a few lessons I learned last week of the softer skilled sort. If you are dealing with friction with someone at work (or helping 2 people in your team deal with their friction) then your best option is to look for the unmet expectation. Maybe they expected to be treated with more respect, or that you would be on time for the meeting, or that something would be done more quickly. Try to determine what the unmet expectation was and help address it and you will remove the source of the problem. This alone won't solve everything but it will help resolve the issue. This is easiest to think about using some examples. Are you waiting on something from another person in order to get your job done and it is late but you haven't heard anything? Do you depend on a process controlled by someone else to get your job done? Have you been pulled into a meeting beyond your control without knowing why? Do you get assigned to projects without having a say? All of these are examples of being impacted by the decisions of someone else. This is pretty common and probably pretty annoying for you (or whomever is on the receiving end). If you are the one causing the impact to someone else, try to always keep them informed. If there is flexibility, then engage them in the decision making about it (even if you only ask for their feedback). You would want this if you were in their place so treat others like you want to be treated. 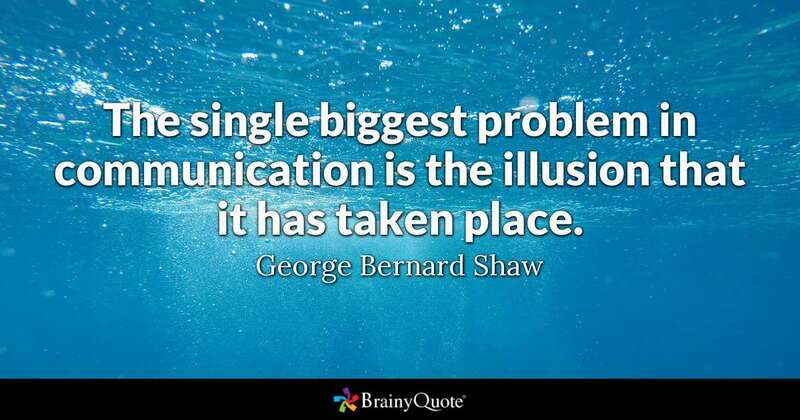 I've come to realize that most relationship and work challenges are caused by poor communication. Did servers go down during a recent release because the database configuration was mismatched between prod and dev? Bad communication. Did a recent feature get built differently than customers wanted? Bad communication. Are users angry because a bug was released that the testers knew about? Bad communication. Was someone surprised by bad news that they should have been aware of? I think you get it... The simplest step to improving communication is to simply take the extra time to do it. 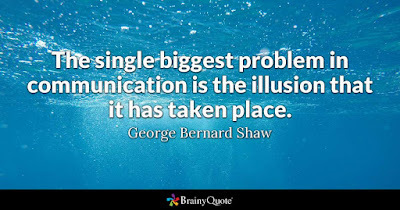 It's not a magic bullet, but most poor communication happens because we didn't bother taking the extra time to communicate for understanding. Try asking people to echo things back when you talk to them this week and do them the favor of doing the same. 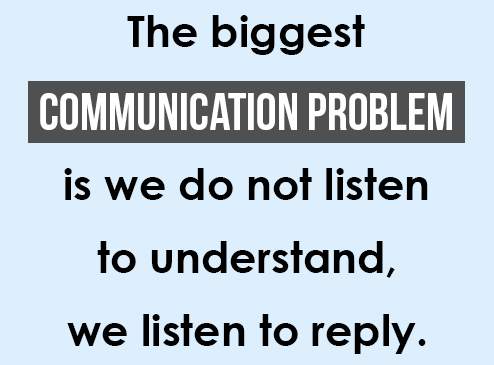 You won't regret spending some extra time on communication but you will regret not doing it when things go wrong. What is the role of a manager? What makes one "good"? Statistically speaking, most of us aren't too happy with our managers. If you are a manager, you probably think you are the exception (the 20-25% that are "good"). I think part of the issue is the common misunderstanding about what makes a good manager. A popular perception is that managers make the tough calls (and decisions), set strategic goals, and tell people what to do (while of course allowing them to decide how...). Whether you are newer to management or have decades of experience, at some point before becoming a manager, you previously were amazingly successful as an individual contributor or small team leader. You always delivered on time and your work quality was amazing. As a result, you were recognized and given more responsibility. You might have even received advice about how you need a team in order to accomplish your newer and broader responsibilities. Now you have more to do and more people to help you do it. No problem because the role of your team is to help you get the job done... right? If this is resonating with you, then you are trapped in a traditional management style. You are seeing the role of your team(s) as support for you. You are still operating like an individual contributor who happens to have lots of assistance. You are the brains and they are the brawn. The trap here is that this actually works for some kinds of less creative and more repetitive jobs and therefore one can find lots of advice out there about how to run a team or organization of this type. For those of us in engineering or other creative fields though, this is a fallacy. The people in a creative organization will not respond well to this traditional style of management and you will not be successful in accomplishing your goals. There is a better way. Invert the pyramid and see that management is a support role. Your team are the brains AND the brawn. You are the coach, mentor, and a supplier. You provide guidance, advice, and resources (money, time, etc.) to help them accomplish their goals. Yes, you heard that right. The goals don't come from you (at least, not entirely... but that's a nuance for a future post). Think about it purely logically, who knows the customers and products best? Is it the CEO? Obviously that's impractical in all but the smallest organizations. How about the senior management team? The same logic continues to apply until you reach the team who is directly responsible for interfacing with the customer and creating the product. The entire organization (including you as a manager) is there to support those teams. Ask your team how you can help them this week. If you haven't been doing this then you will probably get blank stares and confusion. Just hold your tongue and count to 10 slowly in your head. If no one has spoken up yet, then repeat the question and this time count to 20. Give people a chance to think and get comfortable with the reality that it will take time for your team to get used to seeing you as a supportive manager. Explain your supporting role to your team. You might have even done this in the past incorrectly. Don't worry about that. The key here is to explain that you are here to empower them and enable them to accomplish goals as individuals and as a team. Use an analogy like coaching a sports team. Coaches can't tell the players what to do every minute of the game but they can provide training outside of game time and guidance during the breaks in play. In combination with #1, you will begin to see your team culture shift to one of empowerment and intrinsic (vs extrinsic) motivation. Ask your teams what the next (or current) goal should be. If you and your team are used to traditional management then they probably have become dependent on you. Instead of empowering independence you have probably enabled dependence. Don't be an enabler anymore. Give decision making to your teams and embrace your supporting role. They may just echo your current plans to start. This is an opportunity to challenge your own thinking and ask people to suggest why the current plans are wrong. Find the problems in your own plan and ask your team for better options. Suggest that the current plan is likely to fail and you need their help to come up with one that will succeed. Take the role of facilitator and yield the floor at every opportunity. Your aim here is to get them to own the goals because their objectives are probably more effective than yours. Welcome to your modern role in supportive management. One of the hardest things to do as a leader (or person) is confronting someone who is struggling that you are responsible for supporting (i.e. someone in the team/organization who "reports to you"). 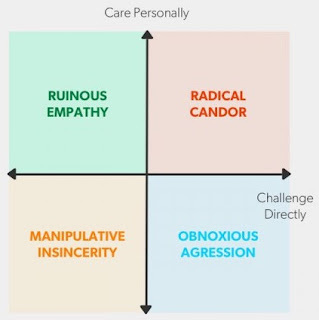 I discovered the radical candor framework a couple years ago when one of my team leaders brought it back from a conference. As a concept, it is fairly simple. In a nutshell, you should care about the individual person enough that you are willing to directly and frankly challenge them for their benefit. This is much easier said than done. Human tendency is to avoid friction by saying what others want to hear (this is on the opposite spectrum from challenging directly - the left side of the diagram above). Some people may even prefer to treat everyone the same way which probably means treating them as resources instead of people (the bottom of the diagram). To be a truly impactful leader who people want to work with, you need to care personally and challenge directly (the upper right in the diagram). So practically, how do we do this? Here are a few things I try to do every week to better support my teams as a servant leader. Tell them what your goals are with them and for them. For example, tell them you want to have a good relationship and you want them to be successful. Tell them you care about them and care what they think. That you want them to be better at things than you are. It's important that you actually do want these things for them. If you don't then you probably need to reconsider if leadership is for you. Be candid and specific with your expectations. Do you have a bunch of mind readers working for/with you? If so, then they already know what you expect of them. If not, you need to be really clear repeatedly about what you expect from them in whatever role they are in. (Setting expectations is a bit of an art and probably deserves an entire training series...) Did their last release go badly? Talk to them about it and explain what you think should have gone better. Were they late with a recent delivery or was it poor quality? Don't act like that was good enough, tell them how it should have been better and why that matters. Failing to set expectations high enough and make them clear to people will leave them stagnating and set them up for failure. Ask how you can support them better. Are you proud of yourself and all your accomplishments as a leader? That's human and pretty normal but you have to be careful to not let your ego take over and become the primary in your relationship with the people you are responsible for supporting (the ones who "report to you"). Are you afraid they will tell you that you are not supporting them? Are you afraid that asking how you can support them means that you will lose power over them? If so, it is even more important for you to admit you cannot get your job done without them. Swallow your pride and talk to your team like they are more important than you... because they are. Welcome to caring personally and challenging directly! Aaron Zeckoski is a technology leader recognized for his expertise in educational technologies and learning systems. He is an accomplished change agent, specializing in organizational transformation and team building. His experience includes leading distributed teams (US and international) and working in matrix and community organizations. In his time as a systems architect and engineer he demonstrated expertise in all aspects of web-based product and platform development. He is an open source advocate, a member of open source developer communities, and a major contributor to open source projects such as Sakai LMS, DSpace repository, Opencast Matterhorn, and Apereo Learning Analytics Initiative (LAI). Aaron is currently Elsevier Nursing & Healthcare Education’s Head of Technology and VP, Software Engineering (since early 2015). He was previously the Lead Architect for Education at Elsevier (since late 2014). He built the education technology department from the ground up; recruiting over 60 technologists in two years. The department specializes in rapid discovery, collaborative innovation, and world-class design. Our delivery highlights include a next generation education platform, NHE’s first machine learning and big data framework, and Sherpath (personalized healthcare learning product). Before 2015, Aaron mostly worked in higher education technology consulting and innovation (list of projects, presentations, conferences, and training for those curious). He was most recently a Software Architect and Sales Engineer at Unicon. He also worked as an independent engineering and training consultant and spent time working with and as part of education technology startups. He was previously a Senior Research Engineer in CARET (Centre for Applied Research in Educational Technologies) at Cambridge University for over three years. Before that he was the Manager of Application Development and Lead Developer in the Learning Technologies unit at Virginia Tech for five years. Beginning in 1993, he spent a handful (or so) years at various IT and software engineering related jobs (mostly in the defense industry) including a short tour as an Oracle DBA and a couple years as a network engineer.